The recession has not dampened Glasgow's Commonwealth Games fervour, nor stopped C&I developments taking place across town in advance of the event in 2014. There's nothing quite like a recession to rain on a city's parade. In November 2007, there were scenes of exultation across Scotland after Glasgow was appointed host city of the 2014 Commonwealth Games. The announcement came barely two years after London scooped the 2012 Olympics and was widely seen as a sign of the strength of the UK economy and a reflection of the depth of the country's event infrastructure. How that has changed. Two years later and rather than showcasing the wealth of investment being poured into venues in the run-up to the games, both London and Glasgow are also at pains to show that they are keeping a sensible lid on public spending. Negotiating that balance has resulted in public disputes in both cities. In London, officials clashed over proposals for temporary event venues, which Mayor Boris Johnson argued created "no long-term legacy value" for the Games. And in Glasgow, tempers erupted last month when plans for a rail-link between the airport and Glasgow city centre ran into trouble after the SNP government scrapped the £207m proposal as part of a wider series of cost-saving measures. It was a move that led to a bitter exchange between local officials and the Scottish government, with Glasgow City Council's Steve Purcell describing the alternative option as "the worst deal in modern history". Despite the disappointment, the city is pressing ahead with the rest of its infrastructural plans, recognising the value of C&I to the city. The Glasgow City Marketing Bureau claims that in the year to March 2009, conference sales booked through the convention bureau were worth £131m, the equivalent of 494,150 delegate days. It also won a bid to host the 2010 Summer Eventia conference, which will be held at the SECC on 4-6 July, enabling the city to showcase its offer to the UK events industry. Meanwhile, more than £500m has been allocated to new venues and infrastructure for the games, with around 2,400 new hotel rooms in the pipeline. "Investors know that Glasgow is going places, which is why they are pressing ahead with plans to open new hotels that will be major additions to our offer for conferences," says Glasgow City Marketing Bureau chief executive Scott Taylor. Plans for further five-star properties include the Blythswood Square Hotel opening later this month (See page 66), as well as the £120m Jumeirah Glasgow, a 25-storey five-star edifice in the financial district due to open in 2011. Meanwhile, Central Hotel, which shut in February after its owners went into administration, has been earmarked for a £20m rebrand under the Principal Hayley umbrella that will see it transformed into a four-star property and conference centre. The Scottish Exhibition and Conference Centre (SECC) is also forging ahead with plans for Scotland's new National Arena, a 12,000-capacity venue set to be an integral part of Glasgow's provision for the games. Glasgow has been a strong draw to both the overseas and Scottish markets, yet can be seen as being too far from London. But some take a philosophical view. "The city can be accessed by three airports and there are train links to the whole of the UK," says Eventia chief executive Izania Downie. That argument will be given greater credence if a Network Rail proposal for a £34bn high-speed rail line by 2020 receives government backing, cutting more than two hours off London journey times. While it also once had a reputation for playing second-fiddle to Edinburgh in the C&I stakes, buyers now believe Glasgow is carving out its own niche in tune with a climate of relative austerity. "You now see very clear distinctions between the two cities," says Dale Parmenter, managing director of DRP Group. "Edinburgh's history, layout and venue portfolio offers more intimate, incentive-based experiences. But, led by the SECC, Glasgow can accommodate larger conferences and generates an event experience that fundamentally feels more business-minded and corporate." This is vindicated by a number of clients that are using Glasgow, including Virgin, Scottish Widows, and Esure Insurance, which is among the corporates to have regular training events in line with an expanding presence there. "The combination of excellent people, superb infrastructure and can-do ethic makes it a perfect city to do business," says Esure chairman Peter Wood. 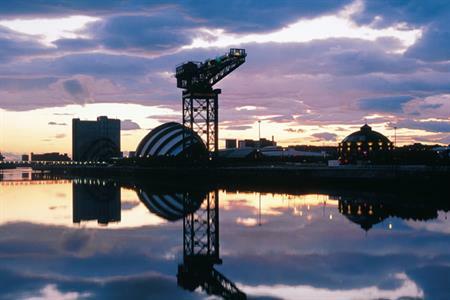 In the run-up to 2014, Glasgow certainly has enough buy-in from the private sector and the C&I community to ensure a healthy future after the Commonwealth Games closing ceremony. For now, though, its challenge is to marry the aspirations of hosting a world-class event with maintaining sensible spending commitments at the tail end of a downturn. It is the kind of conundrum of which London's Olympics officials will be only too familiar with.